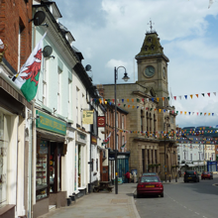 The market town of Welshpool offers an array of shops to suitably meet all the needs of those visiting the town. 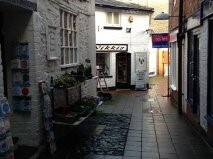 Welshpool has a thriving main high street of shops and cafes, with quaint archways and passages leading to other local offerings. Independent stores dominate the shopping in the town, including jewellers, antique stores and interior furnishings, all offering unique and speciality products. These are complimented by high street favourites such as Boots, WHSmith, Poundland and M&Co. B&M and Aldi have recently opened after building two brand new stores. Two new fashion shops have opened with Kathy Gittins having a shop in Severn Street and East Avenue shoe and accessory shop in High Street. Welshpool is proud to have 2 award winning local shops; Andrews Fish Bar and Rikki Lloyd Butchers, both located on High Street.